There are cut-and-dry affiliate product review posts and then there are posts that people want to read and share. Almost by accident, I stumbled my way from the former to the latter, and thanks to Pinterest, my affiliate product review posts have become some of my most read and shared posts. It was late one night and I had an affiliate product review post due the next morning. It was a product and company that our family loves (this is a huge plus for affiliate products), and I’d written several posts over the course of several months about similar products from this company. Trying to figure out how to “spin” the review post so that it wasn’t a “we love this product and think you will too” repetition of the previous posts I’d written on behalf of the company, I decided to talk about how this product could solve a problem. Instead of selling the product, I sold the solution to the problem. My images for the post, while featuring my daughter using the product, didn’t talk about the name of the company or the product I was reviewing, but they told my readers what the problem was and that if they read my post they would find the solution. I had no idea this post would go viral. In fact, I somewhat regretted the fact that I had waited until the last minute to write it, and I felt that it probably wasn’t my best work on the brand’s behalf. I emailed the post to the brand to let them know it was up, and they were beyond words excited about the content I’d “thrown together,” even though their product wasn’t necessarily front and center. Three months later, I’m still making more money off that one post than I’d made from all the other posts I’d written for that brand altogether. That post is still getting several pins a week and is one of my highest grossing affiliate product review posts. We’d recently started testing out a product that we’d agreed to review on behalf of a brand we’d formed an affiliate relationship with. As I sat down to write my review post, I remembered the post from case study number one, and I decided to test my theory that writing a headline and “marketing” my post as the solution to a problem was the way to go with affiliate product review posts. This time, I did go over the highlights of the product in a bit more detail as it was a new-to-us product and my readers had probably not had interaction with it before either. I didn’t have super high hopes for the post, as it wasn’t necessarily a problem I thought was going to be popular but my post has surpassed my expectations. Once again, the solution to a problem has readers sharing the post and clicking my affiliate links within the post. When you are writing an affiliate product review post, “spin” your post to show your readers what problem the product solves for them. If you’re simply telling them the pros and cons of a specific product, you’re not “helping” them to see their need for the product. Also, be sure to optimize your images for Pinterest and other social media sharing sites by including the problem you’re solving on the image. 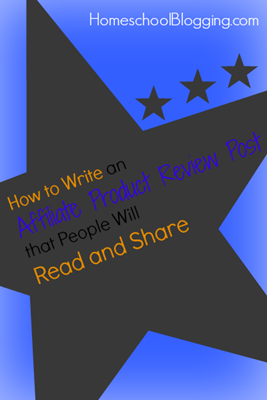 Do you have any tips for writing affiliate product review posts that people want to read and share? Have you had a similar experience with a review post? Be sure to check out our “Find a Brand” page to connect with brands who want to work with bloggers who homeschool! I’m wondering if you could link to your affiliate posts you were talking about, the ones that are doing so well on Pinterest, etc. I’d be interested in seeing them and reading through them to get a better feel for how you did this. Thanks! This is a seriously amazing post! I can’t wait to try it on my next sponsored post. I think all of us bloggers who do these struggle. I want good, quality content (not fluff) and I want to do my best for the companies I work for. I can’t wait to offer more “solutions” to my readers.